The canyon is cut between the mountains of Bioč, Volujak, Maglić and Pivska planina, its 33 kilometer long, deep up to 1.200 meter and river generates immense power used for the power station of Mratinje (342 MW) which dammed the canyon in 1975. The dam is 220 meter high, one of the highest in Europe and creates Pivsko Jezero lake, third largest in Serbia and Montenegro (12,5 km², altitude 675 meter, 188 meter deep), which flooded the old location of the monastery of Piva from the 16th century, so the monastery was moved to the new one. The Vrbnica river flows from the left into the lake. 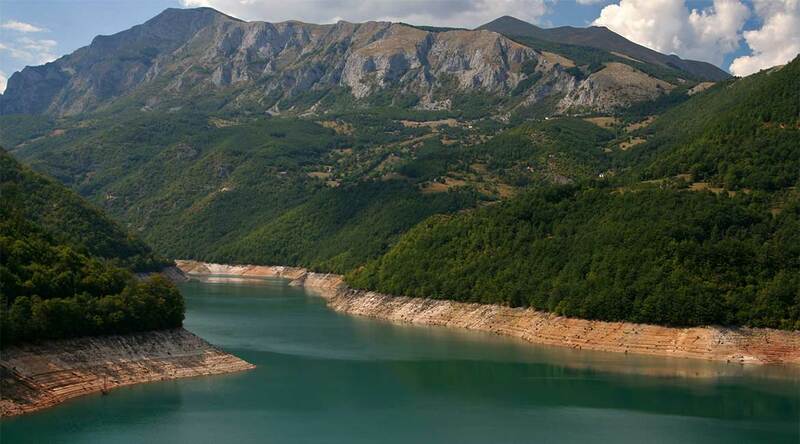 After the dam, the Piva continues straight to the north, meets the Tara at Šćepan Polje on the border with Bosnia and Herzegovina and creates the Drina. The Piva belongs to the Black Sea drainage basin with its own drainage area of 1.270 km² and is not navigable. After several attempts, finally a group of alpinists from Niksic managed to do pass through the canyon. Canyon is about 3.8 kilometer long and it takes almost the entire day for passing. Facilities : Free Wi-Fi Internet, Free Parking, Terrace, Hot tub/jacuzzi, Restaurant (à la carte, On-site coffee house, Bar, Luggage storage, Shuttle service (additional charge), Meeting/banquet facilities, Horse riding (Additional charge), Hiking (Additional charge), Fishing (Additional charge).